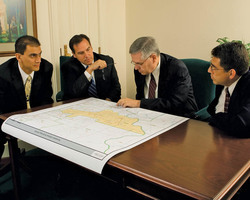 When a person is active in The Church of Jesus Christ of Latter-day Saints, sometimes erroneously called the "Mormon Church," his or her life is full of purpose. The word purpose is defined in the dictionary as intention, resolution, or determination. With these several meanings, purpose is both intent and fruition. There are many aspects of Mormonism for the sincere believer in and follower of Jesus Christ that make life meaningful and fulfilling. Some are explained here. 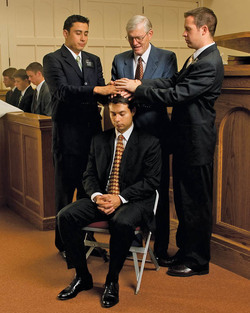 After baptism by immersion (or the "baptism of water") new members of The Church of Jesus Christ of Latter-day Saints qualify to receive the Gift of the Holy Ghost through the Laying on of Hands, an ordinance performed by a worthy man who holds the higher, or Melchizedek, priesthood. This is called the "baptism by fire." Joseph Smith said, "Baptism by water is but half a baptism, and is good for nothing without the other half—that is, the baptism of the Holy Ghost” (History of the Church, 5:499). The gift of the Holy Ghost is something unique to the LDS Church and distinguishes it from all other Christian sects. While the Holy Ghost can inspire anyone, anywhere, this is the only way it can abide permanently. It is impossible to give or receive without direct authority from God. This is the permanent and constant companionship of the Spirit, as long as the recipient continues in worthiness, since the Holy Ghost cannot dwell in unclean places. The Holy Ghost fills a person with light, and also enlightens. The Holy Ghost is the conduit for inspiration — personal revelation from the Lord to guide a person through mortal life. The Holy Spirit warns of danger, testifies of truth, helps to understand the scriptures, comforts and calms, relays the love of God, and helps us make decisions that conform to God's will for them. As sister Beck has conveyed, learning to perceive and to act upon personal revelation is of central importance in every Mormon's life, and it imbues mortality with adventure, since there is a constant push and pull between personal (unenlightened) desires, the world, and the promptings of the spirit. Promptings from the Holy Ghost may take us on some unusual personal journeys, to situations well out of our comfort zones, and toward things that our own plans or reasoning would never surmise. As we follow the spirit, our lives unfold in ways far beyond what we could have guessed, and watching this grand unfolding imbues our lives with purpose. Along the way there are milestones marked by covenant-making, and each step we attain fills us with more light and makes us more like Christ, whom we not only worship, but emulate. As we progress, we are blessed to receive priesthood blessings through the laying on of hands. One such is called a "Patriarchal blessing" and is a road map for our life on earth to help us fulfill all we were meant to do. Other priesthood blessings can heal us, or give comfort, guidance, and insight when we are uncertain. "...they see as they are seen, and know as they are known, having received of his fulness and of his grace...."
Covenants and ordinances in the LDS Church are very important and sacred. It takes work to qualify for these ordinances, as worthiness is necessary. Because of the gift of the Holy Ghost, revelation accompanies all church ordinances, much of it personal to the individual. Shortly after birth, a baby is given "a name and a blessing." This is the child's first ordinance, and one he/she is too young to understand. By the power of the priesthood, the child is given the name by which he/she will be known during mortality. 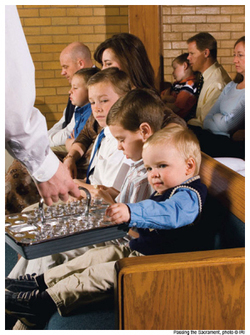 Then the priesthood-holder pronounces a revelatory blessing upon the child with promises for the child's life. At age eight a child reaches "the age of accountability. This means the child is old enough to know right from wrong and to understand how to repent of wrongdoing. Children age eight (and teens and adults who are new converts) may repent and be baptized. Baptism is not to be entered into lightly. It is the gate that enters onto the strait and narrow path to salvation and exaltation. It is symbolic of death and resurrection, the rebirth of a new creature in Christ. Partaking of the sacrament (like the Eucharist, but symbolic) each Sunday renews the covenant of baptism, wherein we promise to take upon ourselves the name of Christ, to always remember Him, and to keep His commandments. In return, He promises His Spirit will always be with us, and with that Spirit, we continue on our spiritual adventure. After baptism, there are many intermediate goals for youth to prepare them for higher ordinances in temples of God. The goal to make covenants in a holy temple is a tangible one for Latter-day Saints. The temple is a holy house, the house of God, and no unholy thing may enter it. Thus, Mormons strive to be "temple-worthy," and temple attendance helps to carry them on their spiritual journey. A temple-worthy person is clean and chaste. The Law of Chastity requires abstinence from sexual activity outside of marriage and fidelity inside marriage. Worthy Mormons also refrain from using alcohol, tobacco, coffee and tea, and from abusing drugs. They pay ten percent of their income in tithes to the Church. They have nothing amiss in their relationships with family members, are honest in their dealings with their fellow men, serve in the lay clergy of the Church, and have a sound testimony that Jesus is the Christ. 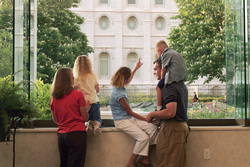 Higher covenants in the temple imbue Latter-day Saints with more spirituality, more connectedness with the Lord through the Holy Ghost, more connectedness to family through eternally linking family members to each other, and more spiritual power. Since the LDS Church has a lay clergy, everyone serves. "Priestcraft" is defined as preaching to get gain, and this possibility does not exist in the Church. A bishop, for instance, does the same work as a pastor or rabbi, but continues at his chosen paid vocation and receives no remuneration for his religious service. A person may receive many "callings" during his or her life, a huge variety of tasks, from working with little children to leading a group of congregations. This service hones the talents of Latter-day Saints. They learn to lead, but also to support and sustain others called to positions of leadership. There is no jockeying for positions, no aspirations to "move up" the ecclesiastical ladder, so to speak. A bishop may be released from his calling five years into his service and then subsequently be called to help in the nursery during Sunday School. Serving in callings, serving in the kingdom of God, fills the lives of Latter-day Saints with meaning, as does participation in all aspects of the faith in association with other like-minded people. Latter-day Saints also serve in their communities, and in humanitarian efforts around the world. Missionary service is a goal of both youth and retired couples. Worthiness is again required, and since missionaries pay their own expenses, much saving and planning is necessary. Missionary service not only helps the world, it makes better people out of those who serve. Mormons believe that families can be together forever when sealed together through holy temple ordinances and continuing in worthiness. This not only strengthens resolve to build happy families, and strengthens resolve to make marriages work, but it also helps to remove the sting of death. When Mormons lose loved-ones, they know where they are going, and they are able to look forward to a happy reunion and closeness to that loved one for eternity. Intention in family life leads Mormons to do things that increase the spirituality of family members, that increase family unity and togetherness, and that teach family ideals. Mormon families strive to read scriptures and pray together, to engage in wholesome recreation, and to develop a good work ethic and service ethic. Of paramount importance is experiences that help family members obtain a personal spiritual witness of the gospel of Jesus Christ, an anchor of faith to last a lifetime. This page was last edited on 24 April 2012, at 20:21.